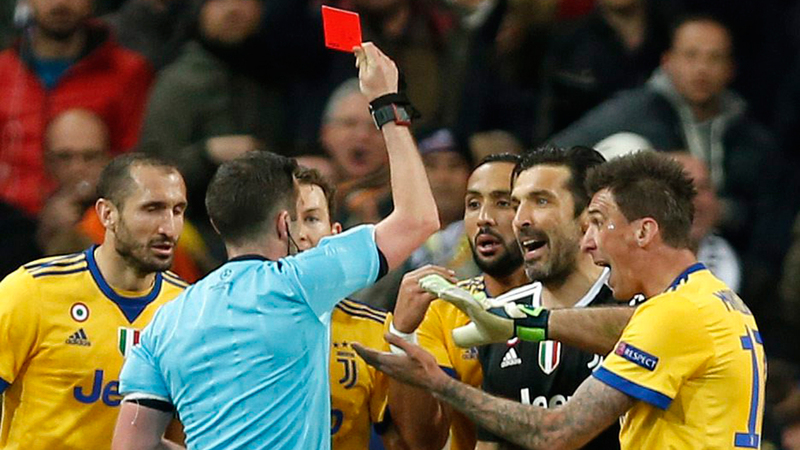 MADRID — Gianluigi Buffon harshly complained against the referee for awarding a late penalty and sending him off in what was likely his final Champions League match on Wednesday. English referee Michael Oliver called the penalty in the third and final minute of stoppage time, leading to Cristiano Ronaldo’s goal that eliminated Juventus in the quarterfinals of the Champions League despite a 3-1 win against the defending champions at Santiago Bernabeu Stadium. Madrid advanced 4-3 on aggregate after having won the first leg 3-0 in Turin last week. "It’s a shame it ends like this," Buffon said in comments translated by Spanish media. "I was very close to the play. If you call a penalty like that in the 93rd minute, you are not a man, you are an animal. You have a trash can inside you, not a heart." The penalty call came after Juventus defender Medhi Benatia tried to keep Lucas Vazquez from scoring from close range after Ronaldo headed down a ball back toward the area. Benatia came from behind Vazquez and appeared to push the forward while making a move for the ball. "To referee in games like these you must be well-prepared," Buffon said. "If you don’t have the personality, you are better off staying in the stands with your family and friends eating some fries. You can’t destroy dreams like that." The Madrid crowd at Bernabeu gave Buffon a standing ovation as he left the field. Reserve goalkeeper Wojciech Szczesny came into the match but was not able to stop Ronaldo’s decisive shot from the spot. "It was an honour to leave the field applauded," the 40-year-old Buffon said. "I’m not sad, I’m proud of the way the team played. We leave with our heads held high." Buffon had a good performance to keep Juventus alive until the penalty call. He made a great save off a close-range shot by Gareth Bale about 10 minutes into the match, and came up big again to block Isco’s angled shot near the end of the half. He also stopped Isco’s low strike from outside the area closer to the end of the match, just barely tipping the ball wide. Buffon said in June that this would be his final season unless Juventus won the Champions League. "We are sad for our captain," Benatia said.